Anguilla is a special and unusual island, in so many ways. Its dry and sunny weather, warm and genuinely friendly people, and pristine, white-sand beaches are the obvious and well-known. It is also famous for its luxurious Anguilla villas for rent, five-star resorts and high-end beach-side dining. For an idea of luxury Anguilla villa living, see the video below. These "cachet factors" include the little bit of extra travel it takes to reach Anguilla, its people's passion for freedom (including not paying taxes), the scarcity of land, and its special status and stability as a separate British dependency since 1980. Still relatively unknown, celebrities and the business elite may go to St. Barths to be seen, but they come to Anguilla to disappear. Its popularity has grown as the likes of Brad Pitt and Jay-Z vacation on Anguilla's sandy shores (leaving the paparazzi and their bodyguards behind in St. Barths!). For the most part, Anguilla still remains hidden, special. We had certainly never heard about it before reading the Blanchards' book A Trip To The Beach. As a result of this unique blend of circumstances, you could be forgiven for thinking that Anguilla villa rentals and hotels are unaffordable. Some, of course, are... running as much as $100,000 per week during the Christmas season. However, many Anguilla villas are owned by people who live off-island most of the time. They rent them the rest of the year. 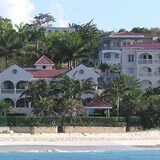 Anguilla villa rentals are true bargains, whether you seek a "$$" accommodation or a "$$$$$" castle-on-the-beach. The best bargain of all, if you plan to live here, is buying and building your very own Anguilla villa. Real estate is still reasonably priced (after the bubble burst in 2009). And building your own home in the tropics is, for many people, a lifetime dream come true. Square foot for square foot (or square meter if you prefer! ), the rent is much less than the price of a one bedroom suite at a hotel. You have more privacy, too. Luxury? Today's Anguilla villas can surpass 7-star luxury hotels. Amenities like room service? How about your own in-house gourmet chef or spa? There are no limits at the modern high-end villas. On the other hand, if you are budget-conscious, mid-range Anguilla villas for rent ($$ and $$$) provide very comfortable and spacious vacation homes. There may be not by any pampering, but grocery shopping can be fun and the price is right! If you're looking for an economical Anguilla vacation, not only will you be saving on the price of an Anguilla accommodations at a $$ villa, you save on eating too! Just stock up the fridge and enjoy your own terrace-top BBQs! Here is how to eat well and inexpensively on this upscale Caribbean island. 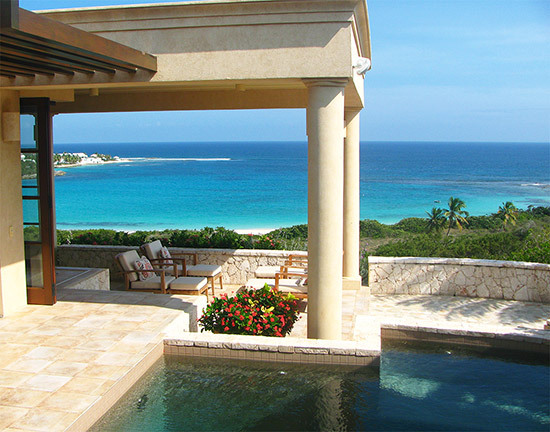 A high-end luxury Anguilla villa, or economical living, everything feels more flexible when staying in your own villa. We always felt more "on our own" and enjoyed that independence. "So What's Your Favorite Anguilla Villa?" That's usually the second question people ask me when we talk about Anguilla (after the beaches of course!). Have you fallen in love with your villa? Share it with everyone! Visitors to this site would love to hear your favorites, too! "I didn't even know I needed that," is a phrase you find yourself saying a lot at Champagne Shores. Plush outdoor and indoor living areas and five luxurious suites lay out over the villa's 7,000 square feet. It is all air conditioned (central air) and it all gazes out to one of Anguilla's most panoramic views of the Caribbean Sea and St. Martin. Beyond the villa itself, service is outstanding. It is the only villa in Anguilla at this price point that includes a personal service attendant throughout the day. Champagne Shores provides exceptional value in every way. One of Anguilla's most iconic ultra-luxury villas, Long Bay Villas sets the pace for plush beachfront living in Anguilla. The property is made up of three villas: Sky, Sea and Sand. Tiered down the hills that line Long Bay beach, the villas emerge from lush foliage like a Grecian-Caribbean dream. Each villa captures a distinct perpsective of Anguilla-blue. With 16 bedrooms and over 19,000 square feet of outdoor/indoor living space, Long Bay Villas is one of Anguilla's premier ultra-luxury properties. Welcome to Anguilla's most sophisticated ultra-luxury villa. Here, relaxed sophistication meets West Indian elegance. At an impressive 37,000 square feet, Santosha has been immaculately designed. Each antique piece has been hand-selected in order to carefully craft the most classic Caribbean experience. Its location is its perfect complement. Right on Long Bay's secluded eastern side, privacy is paramount at Santosha. At 9 bedrooms that sleep 23 guests, Santosha Villa Estate is a perfect escape for large groups and more intimate affairs. One of Anguilla's premier ultra-luxury villas, Nevaeh sits right on the secluded shores of Long Bay beach. Peaceful, with a zen-like ambiance, a Balinese design, eight plush bedrooms and some of the most unique amenities, Nevaeh is heaven. Bird of Paradise is an award-winning luxury Anguilla villa. Built with passion and love, the Dill family tells their story of how they constructed this most unique Balinese-inspired villa, and how they found and fell in love with Anguilla. Sheriva's exclusive property features three ultra-luxurious villas. Each villa boasts 14,000-21,000 feet, with multiple pools, bedrooms, dining and living spaces. With terrific views of the Caribbean Sea, and just a 2 minute drive from Maunday's Bay, the location is divine, too! Exclusivity Villa is, as the name suggests, truly exclusive. Located in the remote Eastern End, on Captain's Bay, Exclusivity stands alone. This luxury villa is for those seeking total privacy and tranquility. A five-bedroom villa that blends a classic Caribbean feel with beach house chic and comfort, Beach Escape Villa is true to its name. This hideaway sits directly on one of Anguilla's favorite hidden gem beaches. It is a "best" if you are seeking true Caribbean beachfront villa living! With expansive views of St. Martin, an infinity edge pool, 3 master bedrooms (with ensuite bathrooms and private patios/balconies), Dropsey Bay at our finger tips, signing privileges at CuisinArt, and personalized, caring five-star service, this is Anguilla luxury for a relatively more affordable price. The Globus family tells how they came to build Tequila Sunrise, a villa full of warm family memories. My sister and my Dad's high-class, luxury Anguilla villa getaway! My Mom and Dad's beach-side Anguilla villa experience! With sweeping views of Anguilla's Southern shore, clean lines, modern Italian furnishings and a large outdoor living space that maximizes the view, Rum Punch impresses from the start. A Caribbean dream home designed for luxurious comfort, tucked away on Blackgarden Bay. This luxury beachfront Anguilla Villa is a top pick for families with children and multi-generational family gatherings. A warm and inviting Tuscan villa with amenities that delight kids from 1-99. Multiple outdoor spaces provide the opportunity to enjoy the sunsets and sounds of crashing waves in a private moment, or all together! Set on the south shore of Anguilla, overlooking St. Martin, Three Dolphins Villa is one luxury villa that exudes a certain warmth and true, tropical feel. Owned by Chelle, here she shares her story of how she came to fall in love with the island and find her dream home, Three Dolphins. Perched on the edge of North Hill overlooking Sandy Ground, this villa is world-famous for its endless views and sensational sunsets. Featured on HGTV, Spyglass Hill is both luxurious and comfortable. With its warm tones and use of wood throughout the house, Spyglass Hill truly feels like "home." From Montserrat, Ian "Sugar George" and Janine Edwards share their story of perserverence and how their project of passion, Spyglass Hill, came to be. 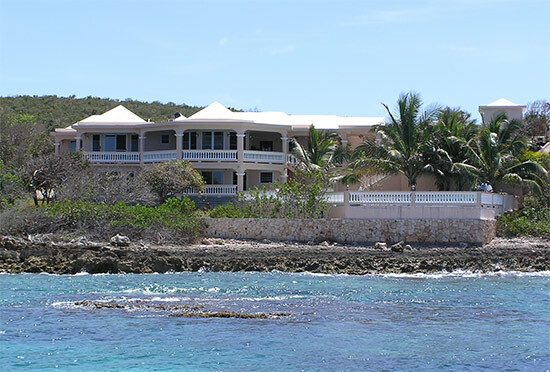 One of Anguilla's coolest villas, Sandcastle Villa: The Beach House sits directly on the sands of Limestone Bay. 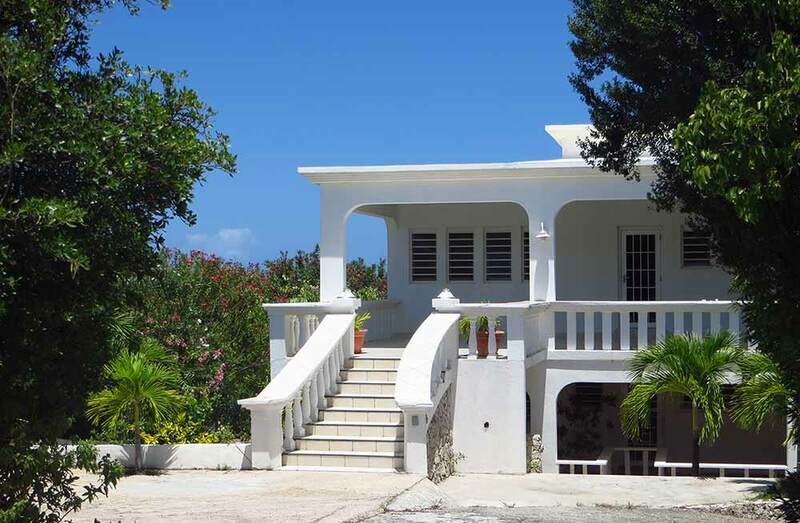 It is one of the few villas in Anguilla that is on the beach and available at a reasonable cost. With all modern furnishings and plenty of activities included (including Jeep and Dingy! ), Sandcastle Villa: The Beach House is a high-value option. Contemporary and chic, Beaches Edge is made up of two five-bedroom, modern villas on the island's south cast. Facing due south to St. Martin, the views are panoramic, some of the most stunning on the island. Each villa features a kitchen (with every superior appliances of every kind), living room, dining room and media center. The villas can be rented together or separately. Modern and newly built, Kiki Villa offers all of the conveniences of home just a short drive from Shoal Bay East. It features luxurious furnishings and many Anguillian accents throughout the villa, in addition to flat-screen TVs, washing machine and dryer, a foosball table and outdoor living spaces with hammock, BBQ and a pool. Perched overlooking windswept Savannah Bay, Wesley House is one of Anguilla's most unique villas. Whimsical in its open-air Caribbean design, and being one of the few villa rentals that overlooks the vast and scenic east end of Anguilla, Wesley House is a personal favorite. Wesley House's official website here. A charming Anguila villa enclave, Twin Palms is made up of two villas, Coconut Palm and Beach Palm. Both have a laid-back, Caribbean beach cottage feel, with all of the amenities you could need to feel right at home in Anguilla, with Meads Bay just a 2 minute walk away (literally across the street from the villa). Our second favorite Anguilla villa, our "happy disaster"... which ended up in one of our best stays ever at an Anguilla villa, perched spectacularly above Shoal Bay East, at a surprising do-able cost. With a stunning view of charming Sandy Ground, and vistas out to Sandy Island and the open ocean, Topaz Villa has one of the best, central locations. Inside there are modern furnishings and plenty of amenities including a pretty infinity-edge pool. Owned by Mary Pat & Raoul of Hibernia Restaurant, Villa Hibernia is an exotic beauty. The three bedroom villa is a far-eastern dream, complete with a pool and set on the sea rocks overlooking idyllic Island Harbour. Tucked into the hill surrounding Long Bay, Morgan Hill Villa offers comfortable, clean and private accommodations with endless views of the Atlantic ocean. Our very first of all of the villas in Anguilla that ever hosted us, of course has very fond memories. After many vacations spent in Anguilla, we return to our "first" Anguilla beach, this time trying a different villa rental. Cheap and clean and right on the same beach as "Ella's"! Belonging to the famous "Sugar George" and Janine Edwards, Little Butterfly is a charming, affordable vacation rental in the Little Harbour area. With modern, luxurious fixtures and finishings, it's an excellent choice for a long-term stay. With Susan & Ambrose as your kind and accommodating hosts, a stay in their home (whether to rent a room, private studio, or their full villa) is infused with Caribbean charm and a true warm spirit. With sea views, a full kitchen and living/dining area it is the complete package. Spacious and bright Anguilla condos with sweeping views of the Caribbean Sea, Ocean Terrace Condos offers super high-value for long-term stays. These villa rentals (complete with private pools) rent as both vacation units and long-term. For the space and design, this is one of the best accommodations deals to be had. Not a full-size Anguilla villa, this one bedroom Anguilla rental is perfect for a couple traveling alone and seeking affordable accommodations. Complete with flatscreen TV, kitchen, terrace with view of St. Martin and even pool access, this gem of a rental is just 30 seconds from Rendezvous Bay. Visit the link above for more reviews of Anguilla villas written by readers of this site. Are You An Anguilla Villa Owner? E-mail me (nori@anguilla-beaches.com) with a summary. Please attach a couple of photos of your villa and yourelf. If you have a story that others will find fascintating, I'll reply with details on how to submit your story. These Anguilla villas, while no longer available, remain in our memories. Cozy beach cottage meets Caribbean cool at Moondance Villa! Set on a peaceful ridge with a vivid view of St. Martin and with excellent amenities, Moondance Villa offers exceptional value. Little Harbour Villa Our second stay on Anguilla was in a spectacular, private villa, gazing out at the St. Martin scenery. We loved it there so much we stayed there twice, before the family moved back in! C-Breeze Inn Villa A friend told us about this economical little cottage on a lake. It's an ideal villa for two travelers on a budget. The Thai House Exotic and mysterious, Nick Douglas' 300 year old Thai House on Shoal Bay East is not only beautiful, but makes for one of the most intriguing Anguilla villa stories. Picture-perfect, The Boat House sits directly over calm waters in the Corito Bay area. Airbnb has reached the shores of Anguilla! Today, more and more villas are listed on Airbnb. It begs the question: is there an advantage to booking via Airbnb vs. with an agent or with the villa directly? More on Airbnb Anguilla villas here. Book early. 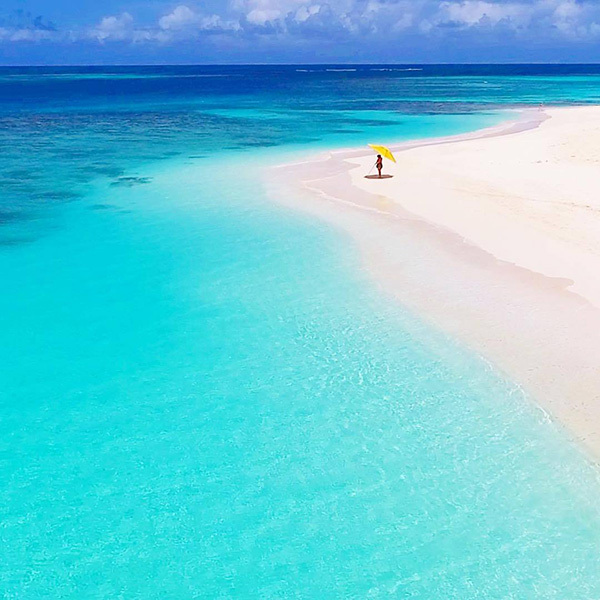 If your week or two in the sun and surf is already booked, my best suggestion is to contact Jackie Pascher, our favorite Anguilla real estate agent. Jackie knows all of the Anguilla villas, and seems to know every Anguilla villa owner on the island. We depended on her to find us our villa before we built our own home and moved here. Here is an important lesson that we learned, the hard way, about why it's so important to have someone in Anguilla, like Jackie, who can take care of you, in the event of problems. My dad originally asked several people about her. She has a great reputation. And since first meeting her, we've come to know her very well. We like her, and more importantly, we trust her completely. She will take care of all your needs and set you up with the most perfect Anguilla villa! Remember, summer rates are much cheaper, and the August boat races are fantastic. So don't eliminate the idea of a summer vacation here.